This is a shoppable image! If you hover and click on it, you can purchase it! How cool is that?! Easy back to school morning routine begins with LISTERINE® TOTAL CARE and having a simple, organized space helps to keep our college student on track with busy morning schedules. Ever since our kids were little, we have always stressed the importance of oral care and how it’s more than just brushing your teeth. Now that they have grown and are college students, we make sure their back to school shopping list includes everything they need to stay presentable and ready for anything that comes their way. We want them to have that extra confidence boost of knowing they are ready inside and out to meet new friends, speak to their professors or prepared to network for that important internship with a potential employer. To my surprise, school stuff was already out for weeks, so I made the pilgrimage to one of my favorite stores and crossed my fingers this would be the trip where I stuck to my shopping list! But, when they have awesome deals for LISTERINE® TOTAL CARE like this: Buy 3, get a $5 Target Gift Card, I will admit, it makes it hard to stick to my list! Thank goodness this offer is good from (6/29-9/9) and will be valid online and in-store because it gives me plenty of time to stock up for both the college kids and home. Score! 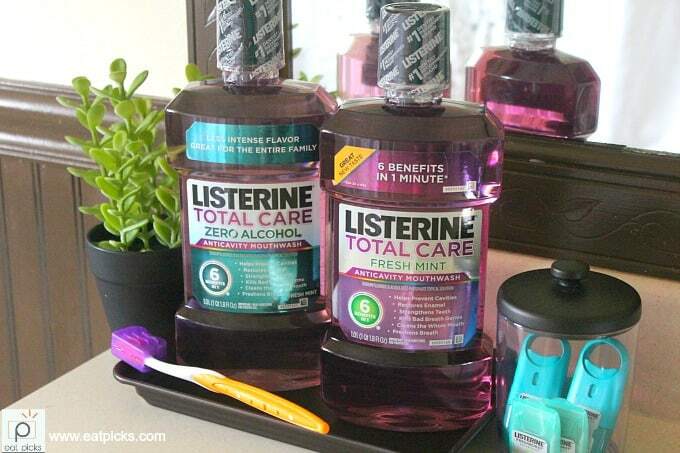 We made our way to the oral care aisle and loaded up on a few items that were on our list, including LISTERINE® TOTAL CARE and LISTERINE® TOTAL CARE ZERO; which has zero alcohol. We like this version much better because it’s milder and less intense than the original mouth rinse but still helps to strengthen teeth & kill bad breath germs! Having a bathroom counter space organized is key to a quick and confident morning routine when your college student lives with 3-4 other students in off-campus housing. They must stick to a schedule when there is only one bathroom. Yes, you read that right. ONE BATHROOM! I can only cross my fingers that creating a neat and easy-to-maintain space will help give a bold start of the day! While at Target grabbing our LISTERINE® TOTAL CARE and LISTERINE® TOTAL CARE ZERO , I also picked up a little tray for the bathroom counter. By having a small area, our college kids can have their own personal space to keep their items at the ready. A quick grab and go and they are set for the day. It’s also a good way for them to keep track of usage and knowing when it will be time to replace when they are running low. We placed our LISTERINE® on one end of the tray, and a toothbrush and a small jar that held floss, breath spray & strips on the other. After seeing the setup, our son asked if we could change it up a little bit. So, we put his razor and shaving cream on the tray too, and it worked great. Next, we simply tucked the tray into a spot on the bathroom sink counter and voila! In less than 5 minutes, we created an easy, neat space. Everything is at hand for him to have a successful morning routine. Your student can customize the space any way they like and maybe, by being so bold to claim a space of their own, their roommates will follow this example. How do you help your student organize their personal space when living with college roommates?